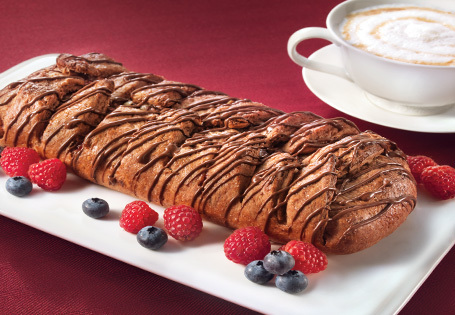 Best served for brunch or dessert with your favorite coffee. In a large bowl, combine dough ingredients until a smooth dough forms. Gently transfer dough from bowl. Lightly coat bowl and surface of dough with cooking spray, return dough to bowl and cover with plastic wrap. Allow dough to rest for 30 minutes. In a medium bowl, use a hand mixer to cream together cream cheese, softened butter, egg, 2 tablespoons sugar and 2 tablespoons corn starch. In a small bowl, combine raspberry preserves and 3 tablespoons corn starch. Cut dough in half. Place half of dough on parchment paper and roll out to a 8x12-inch rectangle, 1/4-inch thick. Place half of raspberry preserves mixture in the middle of the dough, leaving a 2-inch border on sides and a 1-inch border on both top and bottom. Spread half of the cream cheese mixture on top of the raspberry preserves. Sprinkle chocolate chips over the entire mixture. Fold the top end and bottom end over the mixture. Cut 1-inch slits into the sides of the dough every 1/2-inch. Starting at one end, place the strips over the filling, overlapping the strips from side to side, creating a braided look. Repeat with remaining dough and filling. Let dough rest 15 minutes. Preheat oven to 350°. In a small bowl, combine reserved egg white and 1 tablespoon water. Brush the egg mixture on top of the coffee cakes and sprinkle with remaining 2 tablespoons sugar. Bake the coffee cakes for 30 minutes. Allow to cool. Microwave hazelnut spread for 15 seconds, stir, then 15 seconds more. Drizzle hazelnut spread over coffee cakes.